FIPA GmbH (www.fipa.com) has developed a gripper for AUMA Riester GmbH & Co. KG that considerably improves ergonomics in the workplace. The gripper makes it easier to handle electric motors, shortens cycle times and offers a high degree of process reliability.AUMA has been developing and producing electric actuators and valve gearboxes for over 45 years. Today, the company is one of the leading international manufacturers in the sector. The reasons for the company’s success include its high product quality and extensive manufacturing expertise. AUMA places a lot of emphasis on ergonomics in the workplace. 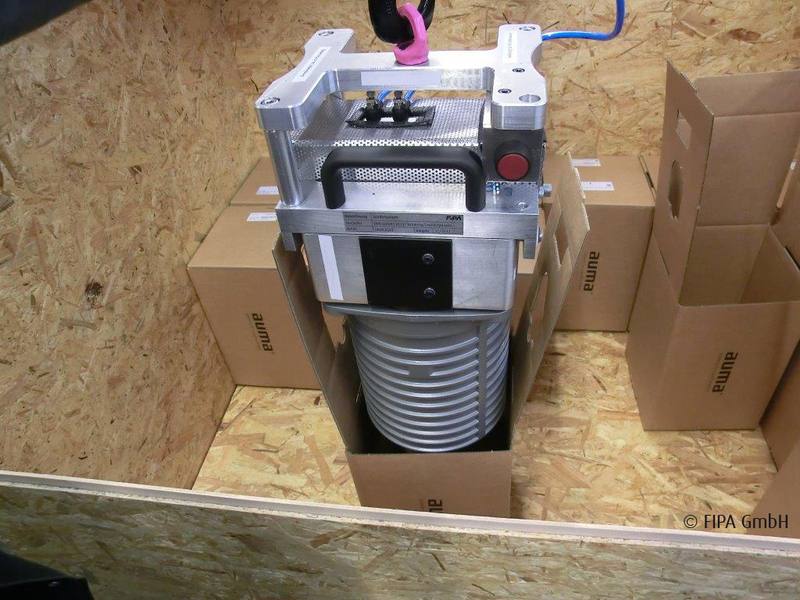 What was required was a solution for removing delivered electric motor housings from their cardboard packaging. In the past, the parts, which weigh around 33 kg, were removed in a complicated and unsafe manner using simple aids such as slings and straps, and then placed in a shipping carton after assembly of the rotor. Ergonomic tool handling As an interim solution, a swiveling jib crane with one-hand operation was selected to support the worker in removing the motor from the packaging and placing it back in the box after assembly. However, threading the tether into the four holes in the motor housing proved to be extremely time-consuming. The narrow packaging makes handling more difficult. There is very little room for maneuver, meaning that clasping the motor with a gripper is impossible. There is only one feasible solution: The gripper needs to attach to the four fixing holes of the motor housing. FIPA develops and manufactures the gripper to individual specifications FIPA developed a customised gripper in close collaboration with AUMA Riester GmbH & Co. KG. It principally comprises two pneumatically driven half shells and four tappets for insertion into the holes in the motor housing. The front of each tappet is equipped with a horizontal resting surface, on which the motor rests during handling. Hung in a pivotable position on a swiveling jib crane, the operator moves the gripper into the correct position above the motor. At the touch of a button, the two half shells move outward by means of air pressure, so that the tappets are above the holes. The finishing touches for aligning with the holes are made by gripping the gripper itself. As soon as the four tappets of the gripper are aligned with the holes in the motor housing, the operator lowers the gripper with the crane until the gripper is sitting flat on the motor housing and the tappets are in the holes. Then the operator presses the button on the gripper and the linear unit moves inward – the motor is clamped. Through a combination of traction and form fit, the motor is securely held by the gripper and can be quickly moved to the desired position in the shipping carton and deposited. The two half shells with the tappets are held securely in their original position using springs. This guarantees that the motor will be held securely, even in the event of a loss of compressed air. Automation of the alignment process would be uneconomical due to the high effort required. In addition to an image processing system, additional linear and rotational axes would be required, as well as a complex control unit. Benefits in ergonomics and efficiency The customised gripper solution from FIPA protects employees’ backs. Thanks to the easy operation and safe handling, fewer errors occur. Cycle times have been reduced. This project is one of many examples of how FIPA is using perfectly designed gripper systems to solve difficult handling issues. Years of experience, an independent construction team and a comprehensive program of standardised solution components as well as willingness to redevelop special parts form the basis for customised grippers.